With minor Glenohumeral joint instability, rotator cuff injuries, or when there is a risk of subluxation, the most appropriate avenue of stabilization is to greatly reduce the range of motion at the shoulder. 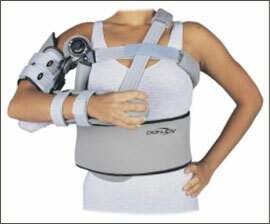 This sort of orthosis is made of soft materials that may be laundered after activity. Utilizing non-elastic straps around the chest and upper arm, this type of strapping can restrict motion to a very specific range while still allowing relatively normalized chest expansion for breathing. 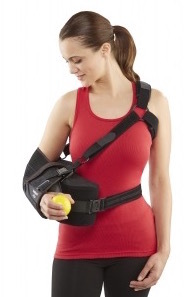 When the Glenohumeral joint is excessively unstable, or after surgical repair, greater control is essential. In this case, the purpose of bracing is to provide a more rigid structure that can nearly eliminate undesirable movements at the shoulder. Along with Velcro straps, the orthosis incorporates rigid cuffs for the upper arm and torso and has metal hinges at the joints that are adjustable and lockable.